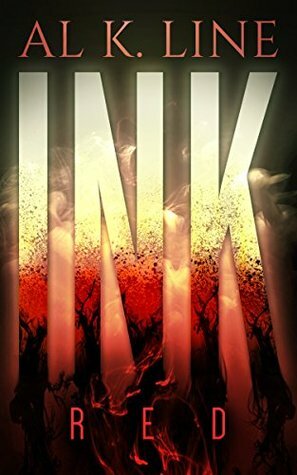 Book Review: INK: Red by Al K. Line - Spectacular Fiction! In a world gone to sleep, someone has to stay Awake. Imagine a world in which most of the population has fallen victim to a mysterious condition known only as The Lethargy, growing increasingly apathetic until they slip into a living coma until they silently pass away. Now imagine that you are one of the survivors, living in a deserted and dangerous world. Welcome to the world of INK. Edsel has been captured by a cult that calls itself The Eventuals, a group in which every member is tattooed red from head to toe. He manages to escape this painful process and make it back home, only to find that his beloved companion Kathy has been killed by the cult. Spurred by the pain of this tragedy, Edsel sets out to get his revenge. Along the way, he meets a young boy named Aiden, who has since lost his parents to The Lethargy (if you’ve ever seen Serenity, The Lethargy reminds me a lot of what happened on Miranda). Aiden is one of the people who is Awoken – individuals who have not only been able to avoid succumbing to The Lethargy, but have gained mysterious powers. Edsel and his companion set off on a journey together, fighting to survive in the post-apocalyptic world of INK. INK starts off at a rapid pace that doesn’t let go until you finish the book. I found myself having a hard time putting the book down as I was reading. One aspect of INK that I appreciated was how the theme of revenge was handled and discussed. This book takes previous tropes in speculative fiction and melds these together to create a unique and unforgettable story. Plus, INK has a surprising little twist at the end. If you loved INK: Red, you can delve back into Edsel’s world with the next two books in the INK trilogy which continues more of Edsel’s story, and The Commorancy series, which explores this post-apocalyptic world at large. INK is available on Amazon. Next post A Science Fiction Double Feature! This sounds really good! After reading your review I went to Amazon to get a Kindle copy. Do you start with the Commorancy series or the INK trilogy? Or does it matter? I hope you enjoy INK as much as I did! From my understanding, I don’t think it matters. INK is a lot more fast-paced than the Commorancy series according to the author, so depending on your tastes I think you can go with either. The first book in the Commorancy series is also free on Kindle! Cool. I’ll have to give one or the other a read soon.